Brrr! Its certainly gotten a lot chillier lately! And being the very cold person that I am I try everything I can to keep myself warm. I would in fact say I go to quite extreme lengths to stay warm often resulting in me looking like the Michelin man! I wear tights socks leg warmers under my trousers, a thermal t-shirt underneath a t-shirt and jumper, with then of course a coat, hat, gloves and snow boots! Anyway I was delighted when Noozie got in touch and told me all about their Noozie Comfort Electric Hot Water Bottle. The Noozie® Electric Hot Water Bottle is the safe and fast way to enjoy cosy heat without any contact with boiling water or kettles. It is a pre-filled cuddly fleece heat pad which, once charged, can stay warm for up to 6 hours (2-4 hours or up to 6 hours in bed). 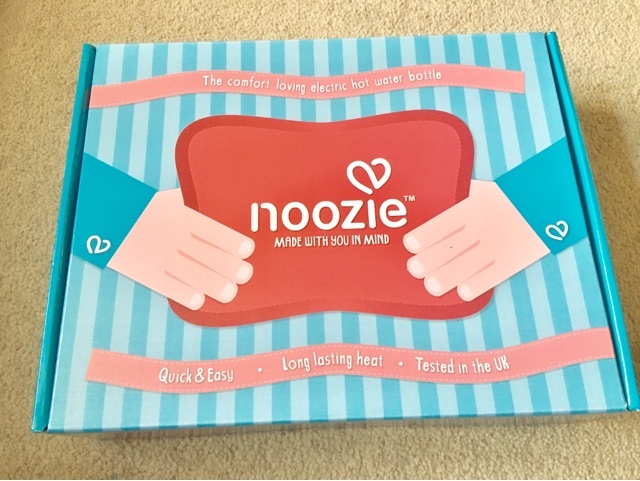 The box itself is attractively designed with the Noozie Logo and pink and blue colours, I love the fact that it is not over packaged either the contents are simple placed inside the cardboard box with only the electric lead secured in plastic wrapping. 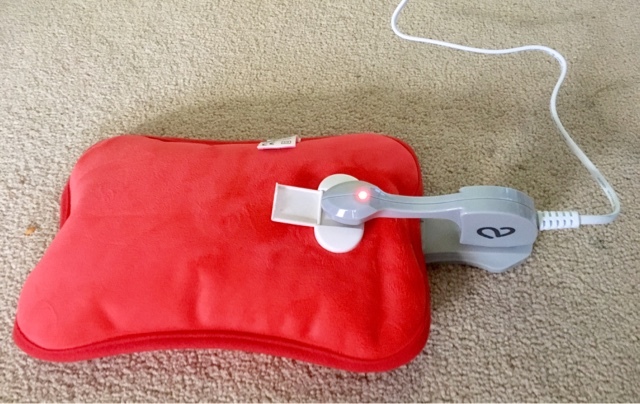 The heat pad is very soft to touch and quite lightweight. On the reverse side is the connection point for the charging lead to be attached. After reading the instructions I plugged in the heat pad and a little red light appeared, once this goes off you need to unplug it straight away so you don’t forget about it and leave it plugged in all day. So I made sure I could see the light whilst it was charging. Noozie® boasts multiple safety mechanisms and is independently accredited in the UK for electrical and material safety. The bottle will warm up to 65°C within 10-12 minutes. Once unplugged the Noozie is very warm and I have to say much nicer to hold and cuddle than a regular hot water bottle. Noozie® has eliminated the risk of burns posed by filling classic hot water bottles, whilst retaining all the advantages of being used cordless: it can be used at home, in bed and on-the-go. Its gentle heat and soft luxury feel can soothe aches and pains, relieve stress and encourage a good night’s sleep. Noozie is the perfect gift for Christmas or would make a great stocking filler for all ages. It is an ideal product for people suffering from chronic pain e.g. chronic back or shoulder pain, abdomen pain, arthritis, TMJ, menstrual cramps, sports injuries etc, and has been rated 4* by Able Magazine. 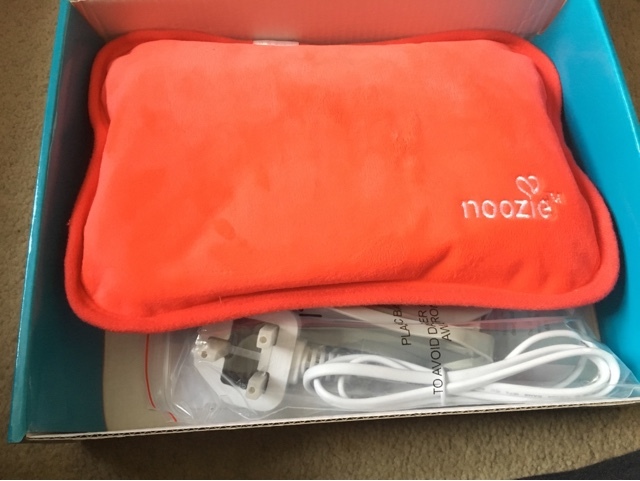 For the purpose of this review I was sent one Noozie Comfort Electric Hot Water Bottle. All thoughts and opinions are my own. Ooo this looks great for the cold winter mornings and evenings! Love the red colour too!